Lock in a great price for Hotel Rio – rated 8.9 by recent guests! 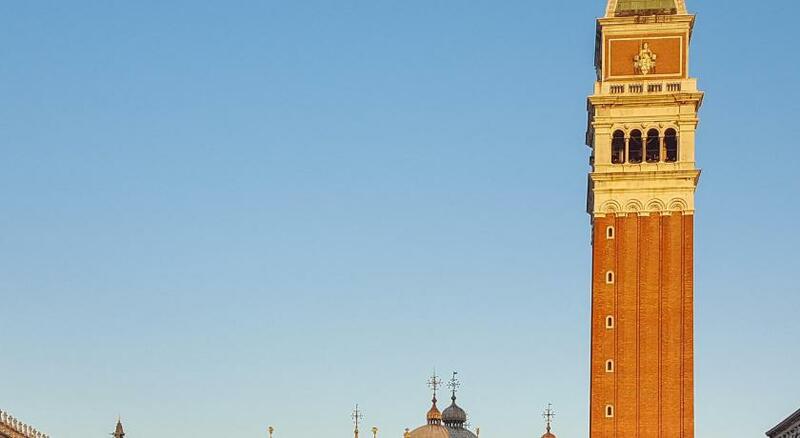 bargain price for hotel 2 mins walk from San Marco. Overlooks lively little square but windows and shutters kept out any noise. Room fully equipped with kettle tea and coffee plus bottle of water included. small fridge was usful. plenty of toiletris in bathroom. friendly welcome. all excellent. Location was awesome. 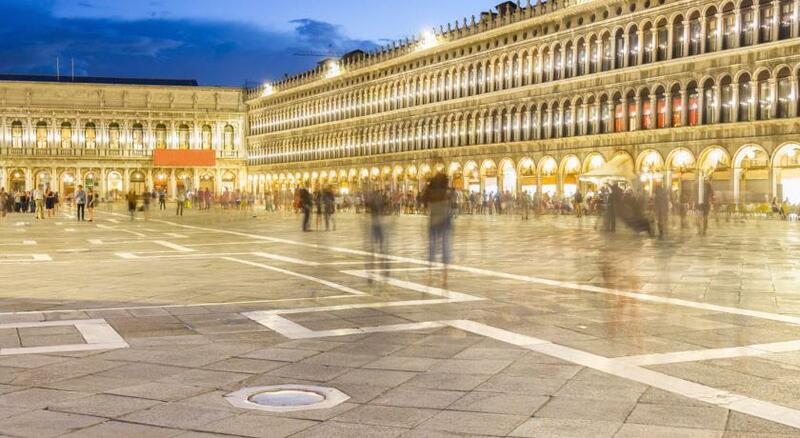 Super close to the San Marco Square. Really helpful staff. The Location was very central and the Staff was very helpful. Great Location in a very charming part of the city. Great location. 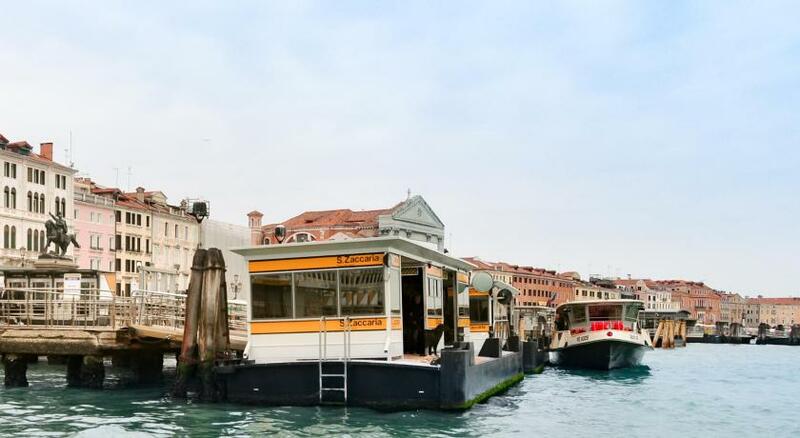 Close to St. Marks, Doges Palace and San Zacharias water bus docks and Alilaguna airport boat dock. Located on a lively small square with dining and shopping. Beds were comfortable and air conditioning worked perfectly. Friendly staff. Definitely would stay here again. Location couldn’t really be any better. Room was very nice for a family. Staff were very helpful. 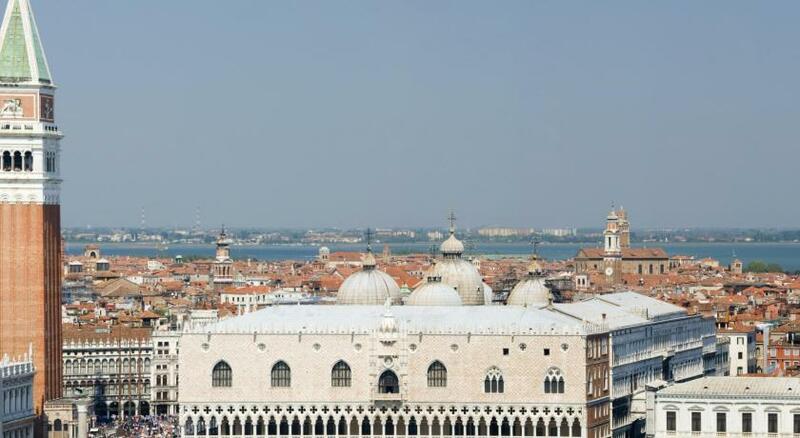 Perfect location for the area of San Marco. Also, water taxi closeness was excellent especially when hauling your luggage on the streets. 24 hour front desk was excellent!!! Would stay there again. Staff at hotel was exceptional! They also provide water bottles every night in the rooms. Almost everything, kinda perfect hotel for that budget, lovely room, bathroom, amenities, 24 hr front desk, lots variant for Breakfast, good coffee and good food. Also they were allowed us to early check-in. Hotel Rio This rating is a reflection of how the property compares to the industry standard when it comes to price, facilities and services available. It's based on a self-evaluation by the property. Use this rating to help choose your stay! 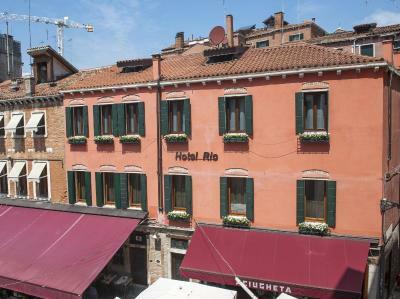 Hotel Rio is in the center of Venice, just 800 feet from Saint Mark’s Square. Free Wi-Fi access is available in all areas. Each room here includes a satellite flat-screen TV, air conditioning and an electric kettle. Featuring a shower, the private bathroom also comes with towels, free toiletries and a hairdryer. 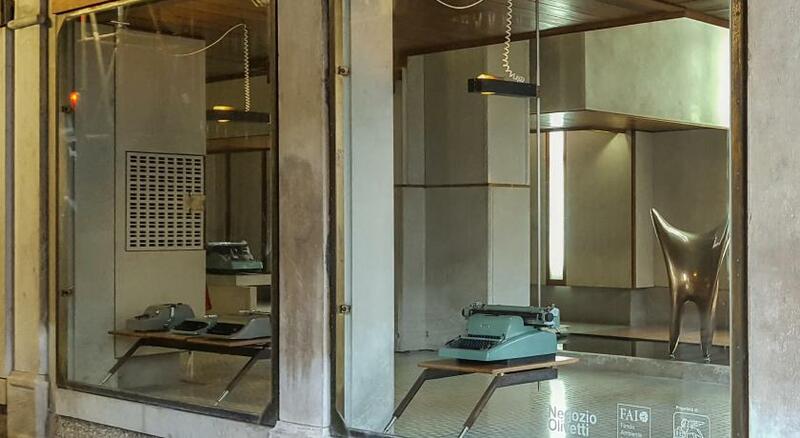 At Hotel Rio there is a 24-hour front desk and a mini-market. Other facilities available at the property include a shared lounge, luggage storage and shops (on site). 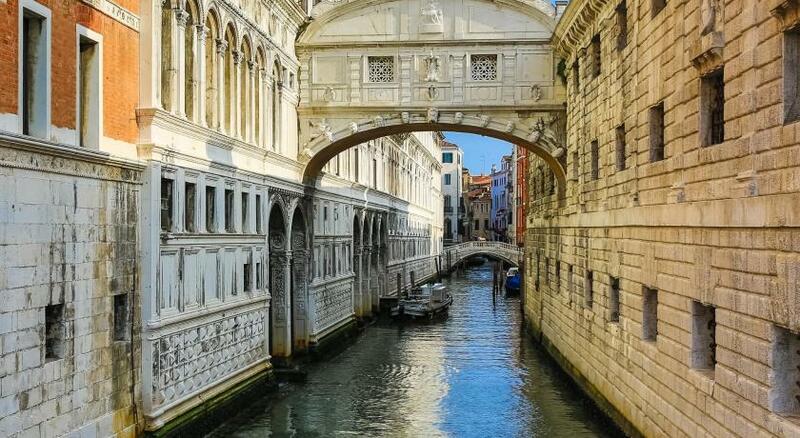 Rialto Bridge is a 10-minute walk from the property. 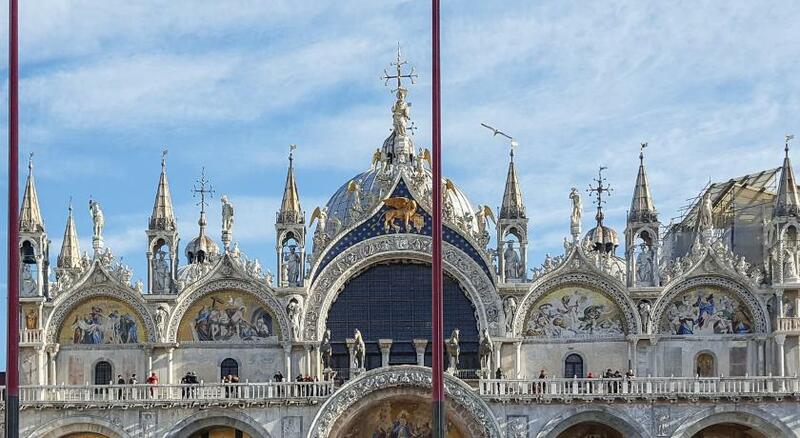 Venezia Santa Lucia Train Station is 1.5 miles away. When would you like to stay at Hotel Rio? This larger room features a satellite flat-screen TV, air conditioning and an electric kettle. Featuring a shower, the private bathroom also provides towels, free toiletries and a hairdryer. Wi-Fi is free. This room features a satellite flat-screen TV, air conditioning and an electric kettle. Featuring a shower, the private bathroom also provides towels, free toiletries and a hairdryer. Wi-Fi is free. House Rules Hotel Rio takes special requests – add in the next step! ATM card Hotel Rio accepts these cards and reserves the right to temporarily hold an amount prior to arrival. Hotel Rio accepts these cards and reserves the right to temporarily hold an amount prior to arrival. 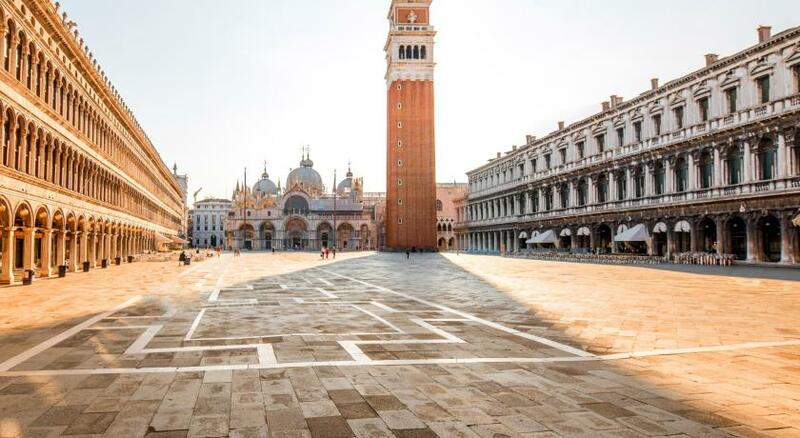 The location is almost the centre of Venice. Many restaurants and supermarkets nearby. 24 hours counter is convenience to us. The room is clean and comfort. Being so central I expected a bit of noise at night, but unfortunately my partner and I barely slept due to constant noise of drunks outside. Being in Venice previously I know the bars and clubs usually wind down early, midnight the latest. However the noise didn't stop (screaming shouting glasses broken) until 3am and then we had two hours of peace until the vendors started their work. Was a very nice hotel but really wasn't expecting so much raucous outside our bedroom in the small hours. The staff are really friendly and helpful! The room although small had great views and was very comfortable and clean. This hotel was beautiful. Room was stylish decorated. Soap and shampoos, and a chocolate on the pillow. Everything perfect. Great family room, bed, shower. 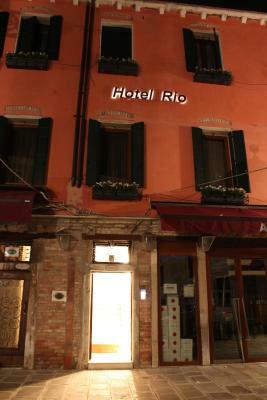 Perfect location 2 minutes walking from San Marcos and vaporetto. Super staff, so nice and helpful. It’s home in Venice. Conditioner/heater was very loud in our room. We had to turn it off for the night. Could be a real problem when it's very cold or very hot outside. Reception, room, bath, bed, tea and shower-gel-stuff were excellent!